Much loved kiwi troubadour Monty Bevins hits the road this May and June to celebrate the release of his new single Lovers Again. 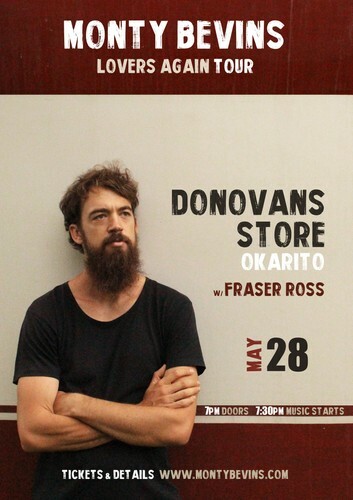 He'll be joined in Okarito by eccentric-folk musician Fraser Ross for this show at the historic Donovans Store. Monty will be joined for this show by eccentric-folk musician Fraser Ross, described by Capital Times as 'New Zealand's best kept musical secret'. No stranger to touring himself, Fraser will be launching a single of his own called 'Marseille' from his upcoming album 'Life is Magic, Where is my Rabbit? ', due to be released in July, 2018 through Home Alone Music. May 28 with Fraser Ross.